I prefer Plácido Domingo because he’s handsomer and I like his voice, but Luciano Pavarotti was indeed the male operatic voice of the latter half of the last century. José Carreras, the second of the two Spanish tenors, and situated in the middle, may be outgunned, but he’s enhanced by the experience. He’s definitely not “the other guy,” as one Seinfeld episode put it. How did The Three Tenors come together? Mario Dradi, an Italian opera producer, suggested a fundraiser benefiting José Carrera’s charity, and to welcome the singer back to performing after Carrera won his bout with leukemia. The rest, as they say, is history. The Three Tenors performed together on and off during the 1990s until 2003. 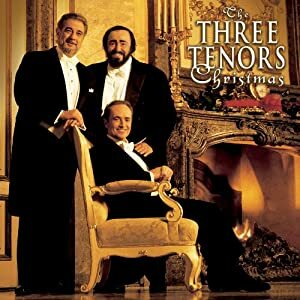 This performance was on December 23, 1999 in Vienna, Austria and was recorded as part of The Three Tenors Christmas video on Sony. “Oh Tannenbaum” or in English, “Oh, Christmas Tree” is from the German, with some lyrics attributed to composer and organist Franz Anschutz, and based on a 16th century Silesian folk song by Melchior Francke called “Ach Tannenbaum.” Five years earlier, in 1819, Joachim August Zarnack had composed a tragic love song based on “Ach Tannenbaum” as well. Anschutz added two new verses and set his lyrics to a traditional folk melody, “Es lebe hoch der Zimmermannsgeselle“ in 1824. It was, of course, about a fir tree. In the song, the fir tree is praised for its evergreen leaves which symbolize fidelity and devotion—in contrast to the inconstant young woman of the Zarnack folk song. 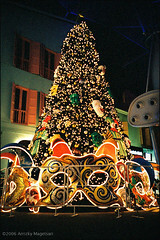 However, the song gradually became associated with Christmas and Christmas trees, thanks to Anschutz’s verses. It crossed over to the United States with immigrants and American travelers and did not become popular in this country until the middle of the last century. Of The Three Tenors, the great Pavarotti, of course, has passed on. Wikipedia states that Plácido Domingo is now performing baritone in opera as his storied voice has since deepened (the older opera singers become, the less they are able to withstand lengthy, 2-3 hour roles; finally, they simply perform in concerts and at recitals). He’s also taken on other, non-singing roles, although some have questioned whether he’s taken on too much. 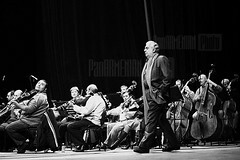 Domingo was General Director of the Los Angeles Opera until this year; previously, he had served as Artistic Director from 2003. Three years ago, after undergoing surgery for colon cancer, he announced that he would not renew his contract as General Director of the Washington National Opera the following year, causing great consternation among East Coast opera fans and critics. So Domingo was essentially assuming bi-coastal responsibilities. There are fewer and fewer stars with Domingo’s stature and name recognition that can attract, develop and help along the next generation, and of course, opera runs the risk of becoming even more anachronistic in the digital age. At that time, Domingo brushed off concern over his schedule. This summer, Domingo was hospitalized with a lung embolism, but was expected to make a full recovery upon his release in August. And Carreras, for whom it all started, is still performing as a tenor. According to Wikipedia, his last appearance in a fully-staged opera was in 2002. Some critics have suggested that his voice was going long before he fell ill with leukemia; Carreras seemingly had problems sustaining the high notes required of tenors; unfortunately, the same accusation was leveled about Pavarotti. In his prime, though, José Carreras was considered to have had one of the finest tenor voices of his generation. Carrera nowadays makes appearances either singing Neapolitan songs at recitals or with special guests in concerts representing other musical genres, ranging from Sarah Brightman to Debbie Harry. Even critics hostile to the Three Tenors phenomenon draw the veil of charity over Carreras’ charmless contributions to those mechanized events, hesitating to point out that his voice lost its luster and lyric beauty long before its owner fell ill. Yet that unpleasant fact never seems to dampen the enthusiasm of his fans, who may be less interested in music and expressive singing than in applauding triumph over adversity. If that is all there is to Carreras’ voice, it’s compensation enough for a lifetime of devotion to one’s art. Enjoy.